The inaugural jam camp featuring the unique teaching methods of Pete Wernick was held in Golden Beach on 30th April to 2nd May 2011. Jam camp instructors for the long weekend were Wernick certified instructor Greg McGrath and his assistant, highly respected and long time local Sunshine Coast resident Bunjie Nichol. The weekend commenced with registration of the 25 visiting jammers, some locals and others who had traveled from Tasmania, Victoria and New South Wales. One participant traveled home from Texas, USA especially for the camp. Some took advantage of the gorgeous Sunshine Coast region and booked themselves and their partners into some of the many resort style accommodation complexes on the coast and made a holiday of their stay. 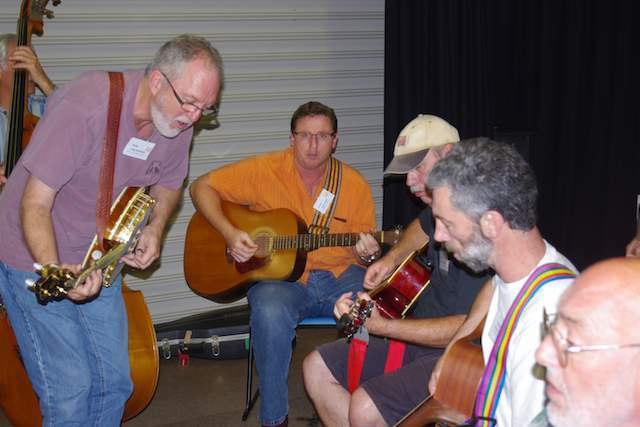 The inaugural 2011 camp delivered a range of experiences and skills to new and closet pickers who, up until that time, had had limited opportunity to meet and play music with others. 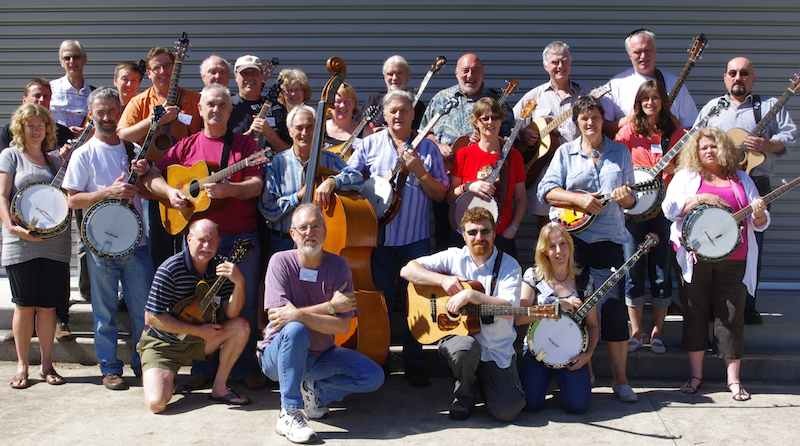 The three days consisted of large group tuition, jamming in a large and small groups, playing a range of bluegrass standards slowly, while being coached on chord changes, jamming etiquette and building confidence. They even had opportunities to learn ho w to find melodies, fake solos and sing in harmony all without music or tab. 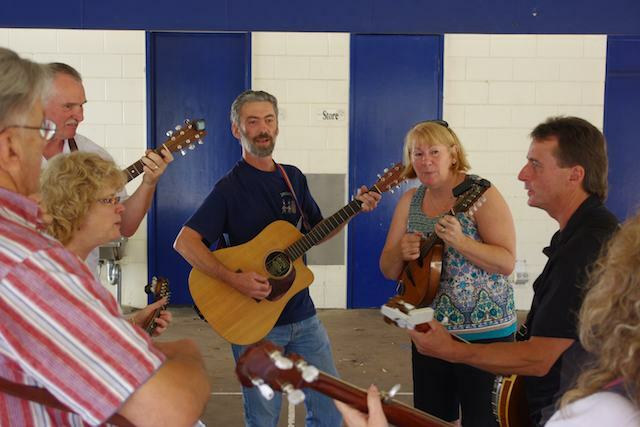 By the end of the third day, jammers were performing in small groups, leading songs in large groups, taking solos and even singing in harmony with each other. Many performed in public for the first time ever at the camp. The three day jam camp was held in the music rooms of the Golden Beach Primary School. Participants met there each day at 9:00am to start work. With breaks for morning and afternoon tea and a stop for lunch the day concluded at 5:00pm each day for the three full days. If you are interested in assisting to host a camp in your region, please call or email to discuss. The requirements are simple and quite straightforward. 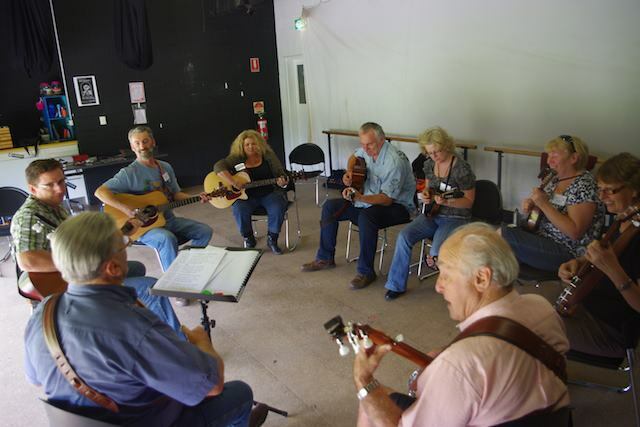 Jam camps can come to your region because the Wernick Method is completely transportable and we are able to travel to your region to host a camp over a two or three day period. Simply call or email us to discuss the concept. Beginning the musical journey can be a daunting and somewhat challenging job. One of the best things you can do early in the piece is to come out of your music room and find others to play music with. It is far more difficult to get to the point where you can pick the melody of a tune from beginning to end than it is to strum along with someone else as an accompaniment. 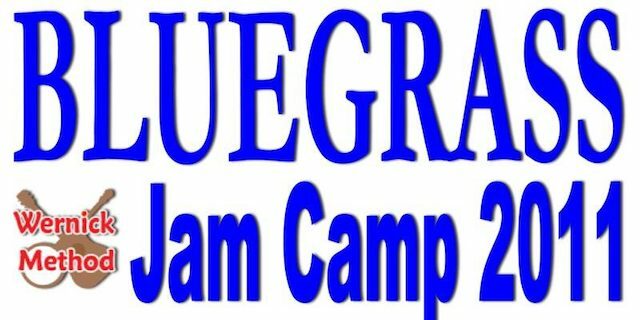 Visit our Jam Camps Australia site now.